Exclusive, limited circulation report, signed and numbered. Packed with analysis and advice that serious hold ’em players and professionals need. Includes full-length, detailed table of starting hands and how often you should fold, call, or raise for maximum profit. Guidelines have built-in deception and sometimes vary from Mike Caro’s straightforward advice in order to put observant opponents off-guard. Requires study and some memorization, so only recommended for advanced students. This rare report is laser printed on our premises at the time of your order. 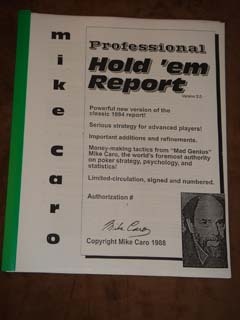 Mike Caro stunned the poker community when he released this far-reaching hold ’em document to a small number of serious players and experts in 1984. It was immediately controversial at the time, because it occasionally elevated some lower-ranking hands and demoted stronger ones in order to deceive opponents. Yet this remarkable game plan has survived the original criticisms to closely mirror the way many of the biggest winners actually play today. How to proceed when you flop top pair while holding a medium kicker? Page 33. A precise hold ’em system for mixing up your play, causing chaos, and walking away with the chips! You’ll actually be playing more conservatively than your opponents, on average, while appearing to be carefree and reckless! It’s part of the masterfully crafted built-in deception when you study and follow Mike Caro’s pro-level guidelines. A balanced strategy for extracting the most profit while keeping hold ’em opponents off-guard. The massive chart gives guidance for every starting hand by position. It advises not just what to do, but how often to do it! Pages 11 through 30. This report isn’t for everyone. It requires work, memorization, and concentration. Because its circulation is so limited, your copy will be laser printed individually when ordered. Signed and numbered. This is Mike Caro’s revolutionary, experimental blueprint for beating hold ’em. It took decades before most experts understood its accuracy and its power.